With flamed-haired former spy Anna Chapman and a sleek race car, Young Guard's congress on Wednesday offered the ingredients of a James Bond thriller. It remained unclear, however, how Chapman — who was deported from the United States in a spy swap in July and has posed half-naked for men's magazines — and her appointment Wednesday as a senior Young Guard member would help the group fight rising nationalism among the country's disenchanted and bitter youth. Thousands of youth staged violent anti-migrant riots outside the Kremlin walls earlier this month, followed by days of nationwide ethnic tensions, in what analysts said signaled the failure of the Kremlin's youth policy. But analysts said the reshuffle at Young Guard that brought Chapman in power would not boost the group's efficiency. “If we want to change our future, we have to begin to change ourselves,” Chapman said in a short and uninspiring speech delivered to a sea of cell phone cameras after she was named a member of the group's public council. Chapman was not the only attraction to capture the eye of the 2,000 people who gathered at the event. Marussia, Russia's first high-end racing car, was also on display. The conference also saw other important appointments made, with Timur Prokopenko, a former spokesman for United Russia leader Boris Gryzlov, becoming Young Guard's new leader, and Public Chamber member Andrei Tatarinov taking up the job of the group's ideologist. Prokopenko pledged to allow no more interracial clashes. “We will not let the criminal rabble do whatever they want in the streets,” he said, referring to this month's rallies to protest the Dec. 5 killing of an ethnic Russian football fan in a clash with Caucasus natives. Neither Gryzlov nor Deputy Prime Minister Alexander Zhukov, who also attended the conference, spoke publicly about the rioting, although Gryzlov praised Young Guard for helping save the country from “destruction.” He did not elaborate. 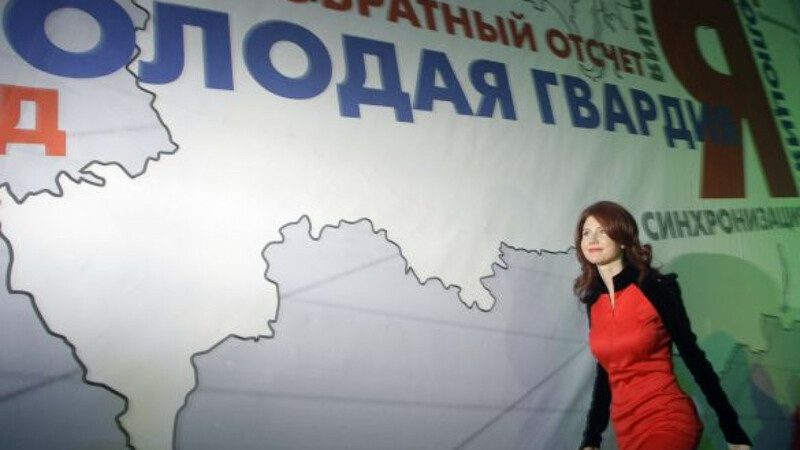 “Anna Chapman is an example of unconditional patriotism,” Tatarinov said Wednesday, Young Guard's web site reported. Meanwhile, a senior Young Guard member told The Moscow Times that Chapman might actually be seeking a ticket to the Duma in next year's elections. “After this mission is achieved, she will leave [Young Guard],” the member said, speaking on condition of anonymity because he was not authorized to speak to the media. Political analysts were unimpressed by the reshuffle. Chapman was elected for “just being good looking,” said Vladimir Pribilovsky, head of Panorama think tank. Prokopenko, a journalist, replaces Ruslan Gattarov, a Federation Council senator with reported ties to Vladislav Surkov, the Kremlin's youth policy chief. Gattarov's removal was first announced in August. At the time, Young Guard called it a planned rotation, but political observers pointed to his clumsy actions during this summer's wildfires. Gattarov was caught doctoring a picture of Young Guard members fighting fires. Independent political analyst Stanislav Belkovsky said Young Guard would not be able to improve its performance under the new leaders. “Young Guard is an organization that doesn't have its own ideology, and it cannot create its own ideas since it is a part of United Russia,” he said by telephone. Young Guard itself has been accused of promoting hatred, most notably over a series of articles targeting opposition activists and liberal-leaning public figures published on its web site this year. Kommersant reporter Oleg Kashin, who was identified as a target “to be punished” in the articles, survived a savage beating last month. Some of Kashin's supporters have implicated Anatoly Turchak, a founder of Young Guard who clashed with Kashin, in the incident. Turchak and the group have denied involvement. Turchak attended Wednesday's congress along with the children of several high-ranking bureaucrats, which Pribylovsky of Panorama said discredited the idea that Young Guard appealed to ordinary youth. “It reminds more of a Brezhnev-era Komsomol,” he said, referring to the Communist youth organization.